Challacombe Bed and Breakfasts. Compare latest rates and Live availability for all your favourite places and places you have always wanted to go using our new My Shortlist feature. Click + to add to your Shortlist. Bed and Breakfasts in Challacombe, Devon for 1 night from Wed Apr 24, 2019 to Thu Apr 25, 2019 within 10 miles, in an Average Nightly price range of £1 to £200. Moorlands is a 19th Century bed & breakfast hotel offering stunning views of the countryside thanks to its location set in 4 acres of gardens and grounds within the Exmoor National Park. Situated within two miles walk or drive of the beautiful North Devon coast path at Woody Bay. Only four miles away are the twin towns of Lynton and Lynmouth which offer a wide range of shops pubs and restaurants as well as Woolacombe and Croyde beaches. br / br / br / br / Our emphasis is on peace and relaxation supplemented with excellent breakfast served in our dining room with views over the gardens towards the Heddon valley Trentishoe common and further towards Wales. Our residents lounge is available to relax next to our real fire with a book from our small library or a nightcap from the bar. br / br / br / br / All rooms are en-suite with bath or shower fully centrally heated with quality furnishings colour TV and beverage making facilities. Two rooms are located on the ground floor if required. We also offer two self catering suites sleeping 2 / 3 up to 6 persons where dogs are welcome in the Dean suite. br / br / br / br / Please be advised the self catering suites are not included in the 3 star rating of the property. br / br / br / br / There are a range of activities available in the area for guests such as horse riding tennis golf fresh and sea fishing. There are acres of Exmoor to explore either with map and compass or one of the many Exmoor Ranger walks arranged by the National Park Authority. br / br / Accessible from our gardens is the lovingly restored Woody Bay Station offering a step back in time with regular steam train rides towards Parracombe. Hidden away in the village of Kentisbury on the edge of Exmoor Nation Park is Beachborough. A grade II listed old Georgian rectory set in 4 acres of gardens and woodlands bordered by its own stream. Perfect for private parties self-indulgent walkers or anyone simply wanting to get away. br / br / br / br / The feel is country house mixed style with informality flag stoned floors marble fireplaces huge sash windows with shutters rather than curtains. This is an easygoing place you have the run of the house and the biggest compliment is you forget you are a guest! br / br / br / br / Beachborough provides an ideal setting for a holiday or a short break near to Exmoor National Park whether to enjoy summer sun or winter gales and log fires. Guests are very welcome to enjoy relaxing in the south facing sitting room. br / br / br / br / Bed and Breakfast Accommodation: Double twin family and downstairs ensuite bedrooms are available. Read More br / br / br / br / Why not have a game of All Weather Tennis on our new tennis court Tennis coaching by arrangement all ages and abilities. Or visit our Games Barn to play snooker table tennis etc! With all rooms having picture postcard views of the Barle Valley you can sit and relax whilst planning your next walk along the banks of this picturesque river. Alternatively take a drive to some of the well known parts of Exmoor and its surrounding coast. Just 7 miles will take you to the stunning beauty of Watersmeet on the East Lyn river or follow the road further into Lynmouth with the cliff side railway connecting the town to Lynton. From here you can walk easily to the Valley of the Rocks or you can go further to Woody Bay Heddons Mouth and the infamous Hunters Inn. Alternatively the coastal resorts of Minehead Ilfracombe and Croyde Bay are all within a short drive. br / br / br / br / Most people come to enjoy the peace and tranquillity of Exmoor exploring the beautiful countryside either on foot or by car. br / br / Simonsbath House offers the ideal base and we are pleased to suggest suitable walks and areas of interest to visit. br / br / br / br / We are proud to offer ten individually decorated bedrooms all with en-suite bath and shower facilities with stunning views of the valley. The rooms all have coloured televisions telephone hairdryer and hospitality tray containing coffee and tea with biscuits and mineral water. br / br / br / br / Our spacious non smoking restaurant provides the perfect setting for you to enjoy your meals. Breakfast is served between 8.30am and 9.30am and dinner orders are taken in the lounge between 7pm and 8pm. br / br / br / br / We are pleased to offer accommodation on both a bed and breakfast or half board basis. Located in Lynton, 46 km from Swansea, Exmoor Manor Hotel boasts a restaurant, bar and free WiFi. Free private parking is available on site. Each room includes a flat-screen TV. You will find a kettle in the room. Every room has a private bathroom. For your comfort, you will find free toiletries and a hair dryer. Barnstaple is 22 km from Exmoor Manor Hotel, while Ilfracombe is 21 km away. The nearest airport is Exeter International Airport, 99 km from Exmoor Manor Hotel. Featuring free WiFi, Cottage Inn offers accommodation situated on the banks of the River Lyn. The property is surrounded by beautiful scenery and many countryside walks can be taken in the local area. Free private parking is available on site and a full English breakfast is included in the rate. Every room is equipped with a flat-screen TV. You will find a kettle in the room. Rooms are equipped with a private bathroom with a bath or shower and shower, with free toiletries provided. The Riverside Restaurant offers flavours from the Far East with a Thai menu cooked to order by a native chef. The on-site FatBelly bar boasts a large selection of local real ales, beers, wine and ciders. The small villages of Lynton and Lynmouth are a 10-15 minute walk away The nearest airport is Cardiff Airport, 39 km from the property. The Cottage Inn is a 17th Century Inn and Brewery on the side of the river Lyn which is a 5 - 10 minute walk from the picturesque Villages of Lynton and Lynmouth. br / br / br / br / Accommodation br / br / All of our rooms have ensuites with high pressure showers rooms to the rear overlook the River Lyn All rooms are cleaned daily and have WiFi and flat screen televisions We also serve cereal and full English breakfast. br / br / br / br / Bar br / br / Our bar stocks a huge selection of spirits wines and ciders from around the World our real passion here is Ale brewed right here on the premises you can be assured of a fresh pint of FatBelly a Devon Ale often served by our Brewer. Details can be viewed at www.fatbellybrewery.co.uk br / br / Restaurant br / br / Our Riverside Thai Restaurant Nartnapa Thai Kitchen serves lunches and Evening meals daily all cooked by our highly qualified Chef Nartnapa We also serve baguettes throughout Lunch hours and a full Roast lunch on Sundays. br / br / br / br / br / br / Parking is Free to all customers. br / br / br / br / Things to see in the area br / br / Lynton and Lynmouth are very popular tourist Villages with the South West Coast path passing through them there is also the famous Valley of the Rocks and Cliff Railway within the area and a stunning harbour at Lynmouth to relax by. The area is most famous for stunning Ruggid Scenery and beautifull coastal walks. Beautiful, secluded and characterful Victorian house, only 7 min walk to Lynton. All rooms en-suite with stunning sea and woodland views, some with balconies. Recommended by Which? Guide to Good Hotels. RAC 4 Diamond rating. This charming old inn is situated in Exmoor National Park, a 25-minute drive from the coast at Ilfracombe. It brews its own beer, has a peaceful garden for guests to relax in, and boasts free internet and free parking on site. Rooms at The Hunters Inn are elegant and traditionally furnished, and each benefits from a flat-screen TV, tea and coffee making facilities, and an en suite bathroom with a hairdryer. Lunch, cream teas, and evening meals can be enjoyed at Hunters Inn. Local ingredients are used to produce a menu of British favourites and tasty deserts. The Bristol Channel is just a few minutes' drive away, and the surrounding National Park has plenty of picturesque routes for walking and cycling. Barnstaple is also within driving distance. Immersed within over 2 acres of private gardens and woodlands, this country house hotel boasts a tranquil setting on the steep slopes of the magnificently wooded Heddon Valley. Heddon's Gate Hotel boasts a relaxed and friendly atmosphere within comfortable and peaceful surroundings, complemented by superb views of the valley. All en-suite bedrooms are individually designed. Originally built as a hunting lodge in the 1890's, Heddon's Gate has been sympathetically extended over the decades. 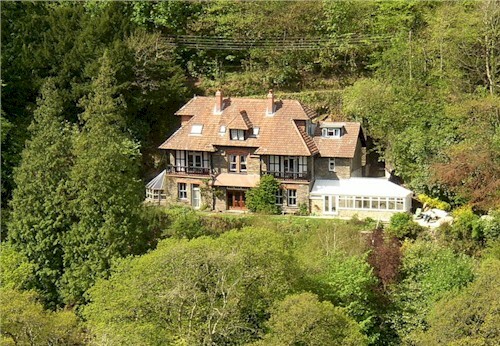 The Denes is a 4* guest house situated in Lynton. Within the Exmoor National Park - an area of outstanding natural beauty and coastal scenery. An Edwardian house is in Lynton, a mere stone’s throw from the entrance to the Valley of Rocks. We offer immediate access to picturesque walks and cycling routes in Exmoor National Park, as well as a comfortable place of refuge at the day. On the Exmoor Heritage Coast, Kingford House in Lynton is set in its own garden at the base of Hollerday Hill, and looks out towards the Valley of the Rocks. It offers free parking and WiFi and home-cooked English breakfasts. Each room has a flat-screen TV with DVD player, alarm clock and tea and coffee facilities, and has views of the garden. All rooms have an en suite bathroom with toiletries provided. A traditional full English breakfast is served each morning. Home cooked evening meals are also available, with a regularly changing menu making use of local produce. The town's attractions include the Lynton & Lynmouth Cliff Railway, and the West Somerset Rural Life Museum in Porlock is around 30 minutes' drive away. Dunster Castle is just over 20 miles from Kingford House.